How Is Hair Color Determined? Hair color is determined by two different forms of pigment: eumelanin (which is the largest influence) and phenomelanin. Eumelanin is a black pigment, and phenomelanin is a red or yellow pigment. Hair color is determined by three factors having to do with pigments: how much pigment is present, to what degree a eumelanin or phenomelanin is present and how close together the melanin (pigment) granules are. The more eumelanin a person has, the darker his hair will be. Eumelanin is made up of melanocytes, which are cells that give skin and hair its color. This is the reason why people with blond hair often have lighter skin, while very dark-haired people have dark skin. 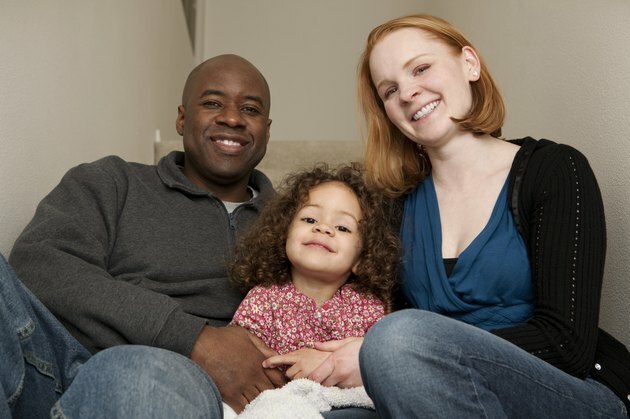 Each parent contributes four hair-color genes, for a total of eight genes. Eumelanin genes are not recessive or dominant. Instead, a eumelanin gene is either "off" or "on." For example, using the representative letter "E," a large E will be an "on" gene, while a lowercase e will be an "off" gene. The mom contributes EEee while the dad contributes EEEE. The result for the child will be EEEEEEee, meaning a child will have dark hair. The more "on" E genes a child receives, the darker the resulting hair color will be and the tighter the granules will be packed together. Phenomelanin is passed down via a different gene known as an allele. Only European-Americans carry this gene. If a parent has these alleles (especially if she has blond or red hair), these alleles will likely be passed down. However, if a significant amount of eumelanin is present, this will be expressed more than the phenomelanin. Because hair-color genes are additive rather than dominant or recessive, a child may have a very different hair color from his parents. However, parents with very light or very dark hair likely carry a large number of "off" or "on" hair-color genes. Other examples of genes that are not dominant or recessive include hair texture (curly, wavy, straight) and blood type. The result of these genes is a hair color, determined by the three factors mentioned earlier. Black hair contains the most eumelanin granules, therefore making them more tightly packed. Red hair contains high amounts of phenomelanin that are loosely packed. Very blond hair has the least amount of pigment, the least granules and the farthest-apart granules. Why Do Moles Grow Black Hair?